Charleston Syllabus | Keisha N. Blain, Ph.D.
On June 17, 2015, a white supremacist entered Emanuel AME Church in Charleston, South Carolina, and sat with some of its parishioners during a Wednesday night Bible study session. An hour later, he began expressing his hatred for African Americans, and soon after, he shot nine church members dead, the church’s pastor and South Carolina state senator, Rev. Clementa C. Pinckney, among them. The ensuing manhunt for the shooter and investigation of his motives revealed his beliefs in white supremacy and reopened debates about racial conflict, southern identity,systemic racism, civil rights, and the African American church as an institution. In the aftermath of the massacre, Professors Chad Williams, Kidada Williams, and Keisha N. Blain sought a way to put the murder—and the subsequent debates about it in the media—in the context of America’s tumultuous history of race relations and racial violence on a global scale. They created the Charleston Syllabus on June 19, starting it as a hashtag on Twitter linking to scholarly works on the myriad of issues related to the murder. The syllabus’s popularity exploded and is already being used as a key resource in discussions of the event. 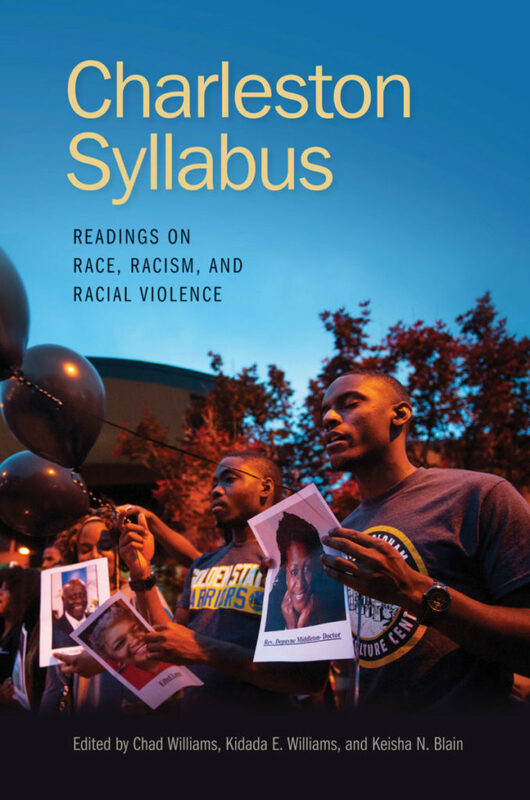 Charleston Syllabus is a reader—a collection of new essays and columns published in the wake of the massacre, along with selected excerpts from key existing scholarly books and general-interest articles. The collection draws from a variety of disciplines—history, sociology, urban studies, law, critical race theory—and includes a selected and annotated bibliography for further reading, drawing from such texts as the Confederate constitution, South Carolina’s secession declaration, songs, poetry, slave narratives, and literacy texts. As timely as it is necessary, the book will be a valuable resource for understanding the roots of American systemic racism, white privilege, the uses and abuses of the Confederate flag and its ideals, the black church as a foundation for civil rights activity and state violence against such activity, and critical whiteness studies.